WHAT IS YOUR APPLICATION FOR AN INVESTMENT BANKING JOB MISSING? Unfortunately attending a prestigious University and coping well with your core curriculum is actually considered a minimum effort nowadays. A first class honors degree is seen as a necessary prerequisite and participation the “Finance Society” or “Investment Banking Society” of your University is a common thing that everyone does. Yes, it consumes 2 of your precious free evenings, but that’s life (or that’s the reality of this industry) – being an excellent student, active outside the lecture hall is great, but doesn’t improve your odds of securing that all important graduate job. Statistical evidence suggests that the proportion of students getting first class honors is increasing. Thus the number of differentiating factors for employers is declining, leaving students who had focused on their studies predominantly left at the bottom of the jobs market pyramid. The rapid increase of the number of first class graduates is mainly due to the widespread perception among students that they need 'the essential 2:1' to be even considered by employers. A recent survey implies that almost four out of five employers sorting through job applications from graduates are insisting on a minimum 2:1 grade. Which clearly contributes to intensifying the competition among candidates. In March 2014 the avarage salary in investment banking was £62,526 compared with a UK average of £31,8181.Furthermore, although the 2008 crisis shrunk the hiring quotas, the post-crisis regulatory climate only boosted the demand for finance professionals. 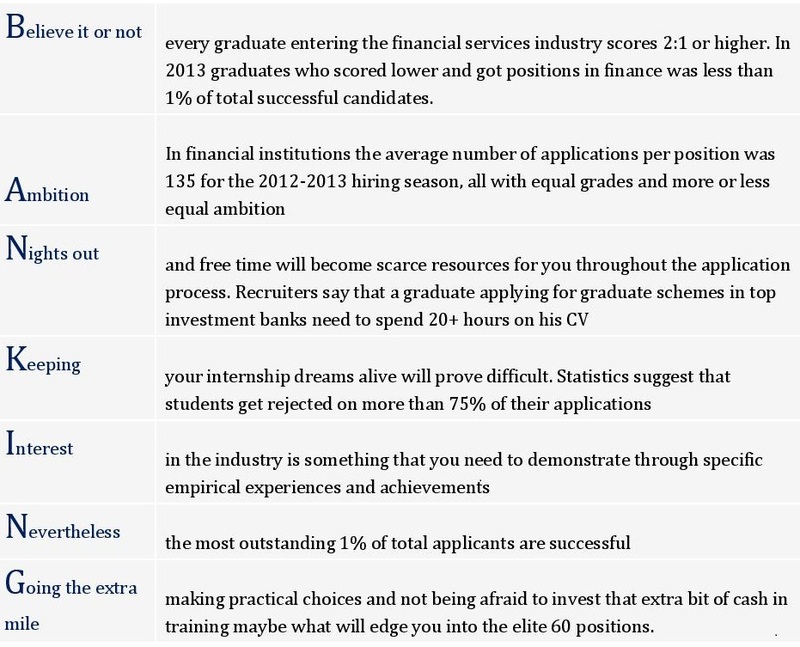 Top tier financial organisations tend to receive up to 5000 applications for their summer internship programsalone. Bearing in mind that the pools are rarely larger than 150/200 positions per year, this means that a gradute competes with more than 30 peers for one position. A top tip given to graduates at recruitment events is “differentiate yourself”. A typical internship/graduate scheme application includes an irrelevant internship or part-time work experience and activities such as sports or university societies that do not demonstrate interest in the industry or leadership skills. Thus, a new approach is needed by those who wish to differentiate themselves. University students hardly have the chance to gain relevant to finance practical experience. Statistical evidence from the UK suggests that the most likely jobs students are going to find before graduating, will be positions within retail or administration which do not allow them to develop skills that finance recruiters find relevant. Regardless, given the tight headcount targets set by corporate strategists, employers want students to have “relevant practical industry knowledge” and to be able to take responsibility early after joining the firm. Unfortunately, most university courses are generic and based on broad topics. What graduates require is specific training which is based on industry trends, yet not so complex to overwhelm them so early on in their career. In addition, courses like CFA are not recommended unless you have 2-3 years practical working experience within the industry and their pass rates are very low – less than 40% on average. With such limited array of opportunities to differentiate themselves, students need to recognize the most pressing issues in the industry and acquire relevant knowledge and skills. Since 2008 financial crisis, the financial industry has been much focused towards regulations and regulatory controls such as FATCA, Dodd Frank and The Volcker Rule, MIFID and LEI. Our analysis shows that this is one area where students can capitalize on gaining knowledge and gaining a practical understanding of what these regulatory requirements mean for banks in terms of practical “change” or work banks will have to perform internally to be compliant. SNK Financial’s FATCA training programme is designed to do just that. Provide students with a simplified understanding of the theory behind this IRS regulation and a high level overview of what banks need to do to be compliant. The course suggests at which levels analysts may be required and describes of the kind of work they have to do. The Volcker Rule training course is embedded in the context of the Dodd Frank Act and provides an extensive overview of the regulatory initiatives introduced in response to the 2008 crisis. The course is built by regulatory experts currently working in the industry and offers real life, ready-to-apply solutions. Consult www.snk-financial.com for more about any of the above courses. For a preview of the syllabus and course materials please check our FATCA course trailer here and our Volcker Rule course trailer here.